This option only applies to Office 2010 / 365 / 2013 / 2016 users. Office 2013 and 2016 use the File tab and the Microsoft Office Backstage view, which is what you see after you clickFile. 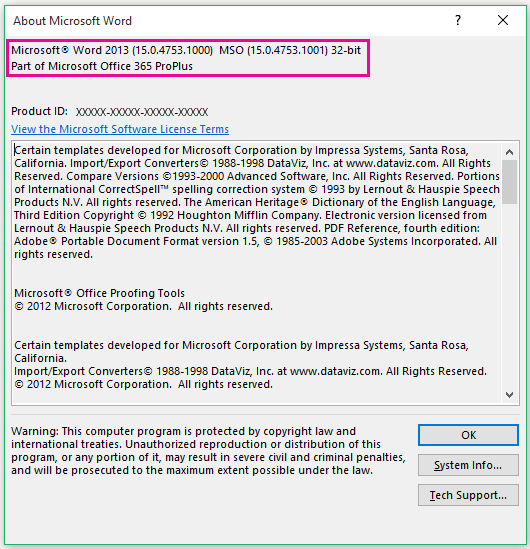 Here's what you see in Word 2013 after choosing File > Account. NOTE In Outlook, you click File > Office Account. 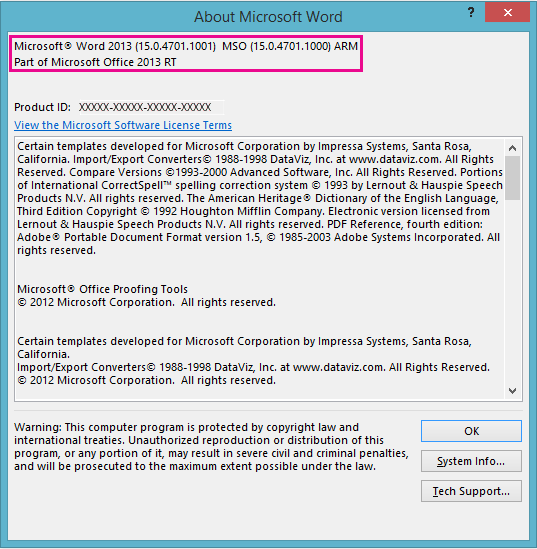 Shows if you have a one-time purchase Office product, what Office product it is, and if the product is activated. 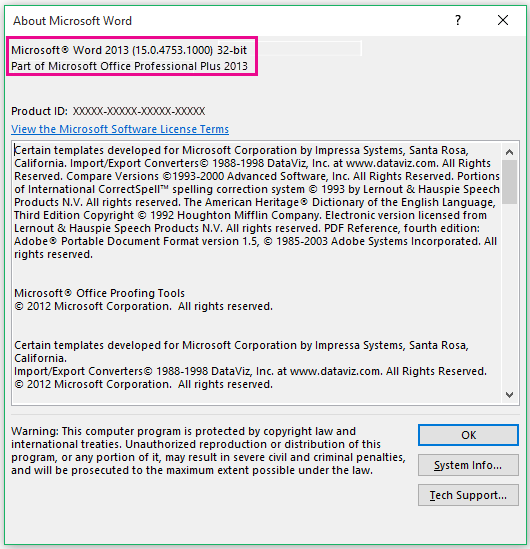 After you click About Word, you’ll see what bit you are running—32-bit or 64-bit. Office 365 subscription uses the File tab and the Microsoft Office Backstage view, what you see after you click File. Here's what you see in Word after choosing File > Account. Shows if you have a subscription Office product and what Office product it is. Shows you the full version number. TIP Choose Update Options to install updates. On the Microsoft Surface RT, there’s only one version of Office that’s designed to run on the tablet’s ARM processor, Office 2013 RT. 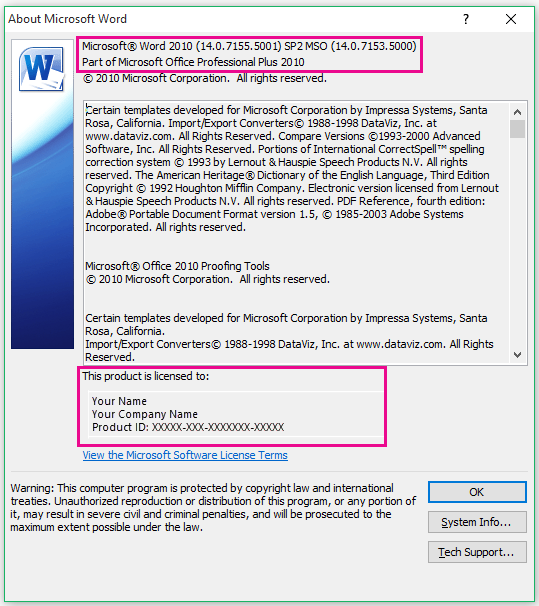 Here's the version information in Word RT after choosing File > Account. 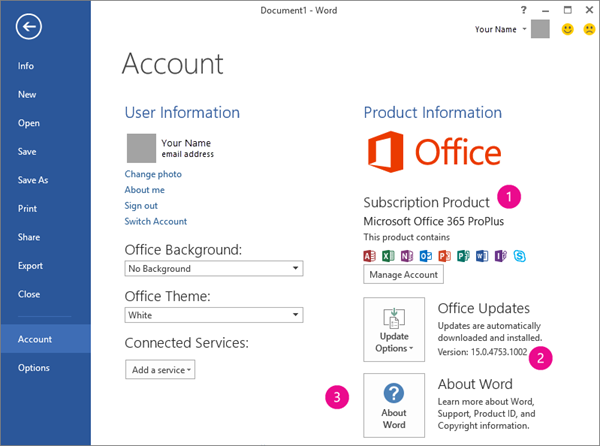 Shows you what Office product it is and if the product is activated. 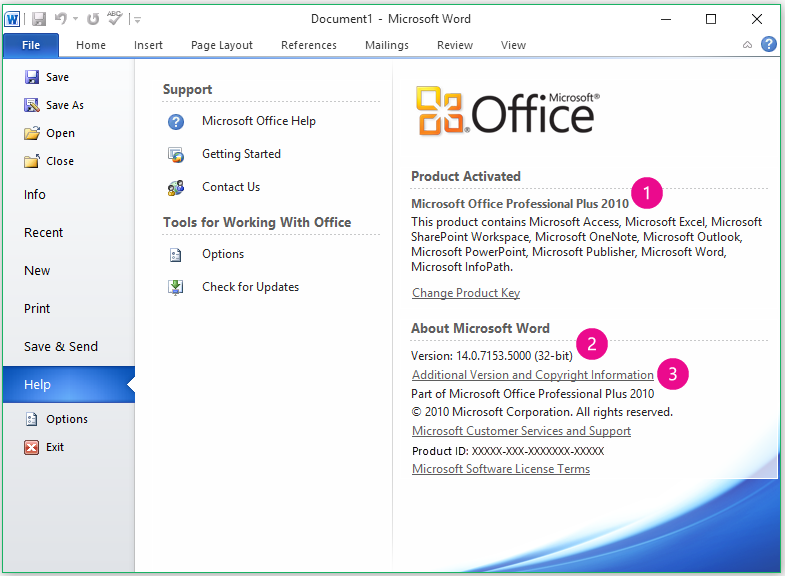 After you click About Word, you’ll see if the Office application is part of an Office suite. Office 2010 introduces the File tab and the Microsoft Office Backstage view, what you see after you click File. Here's what you see in Word 2010 after choosing File > Help. 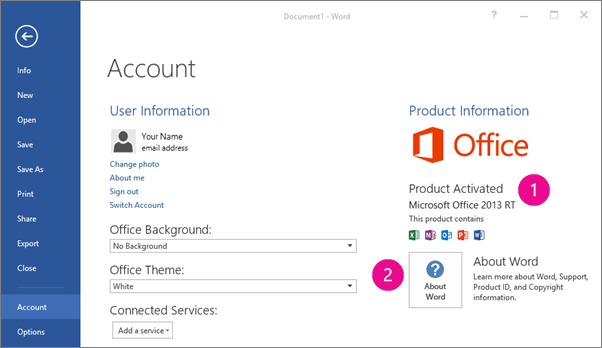 Shows you what Office product it is, and if the product is activated, and what applications are included in the Office product. Shows you the full version number and if you are running 32-bit or 64-bit Office. After you click Additional Version and Copyright Information, you’ll see what service packs and license information. If you're not sure what version you are running, please open an Office application (we use Word in our examples), and look at the UI to help determine what version you have. You either have Office 365, Office 2016, or Office 2013. Choose File > Account. From here, you can see the specific version installed and also the bit version. You have Office 2013 RT. Choose File > Help. From here, you can see the specific version installed and also the bit version. Choose Microsoft Office Button > Help. From here, you can see the specific version installed. Office 2007 only comes in 32-Bit. Choose Help > About Microsoft Word. From here, you can see the specific version installed. Office 2003 only comes in 32-Bit.